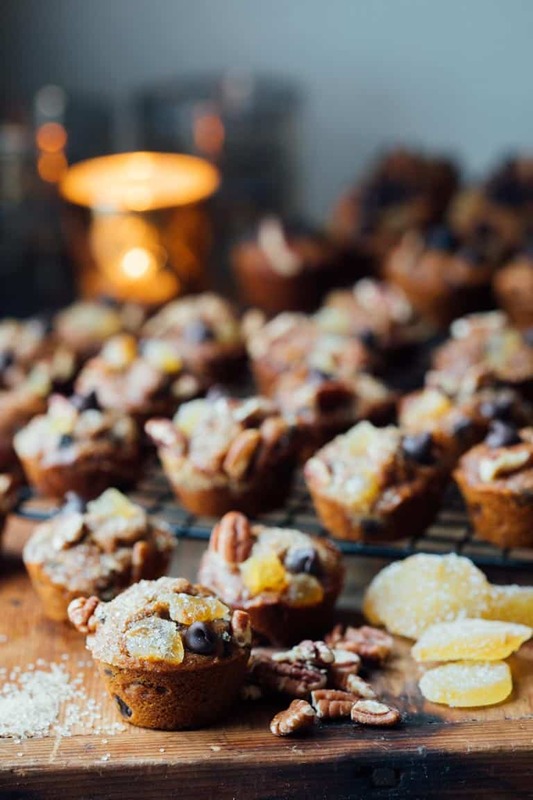 Today I have the most precious little nuggets of goodness to share with you… Mini Fruitcakes! Wait! Don’t roll your eyes! Hear me out. They are the perfect tiny whole wheat and dairy free sweet treat to take to a cookie exchange or add to your holiday cookie platter! I originally shared this recipe on December 6, 2011. I have updated the images and some of the text today. When it comes to fruitcakes, you’re either with them or you’re against them. Personally, I love a good fruitcake. Please don’t hold that against me. I’m not saying I like all fruitcakes. I do not go anywhere near the brick-like cakes filled with day-glow cherries. But I do like a good fruit cake. Meaning, one that has real fruit in it. Lot of nuts. Booze. This month I am invited to two cookie exchange parties. I wasn’t going to make cookies this year. Instead I was going to try to limit my holiday baking to developing a healthy fruitcake recipe, without the above mentioned day-glow cherries. Then I had a little brainstorm. 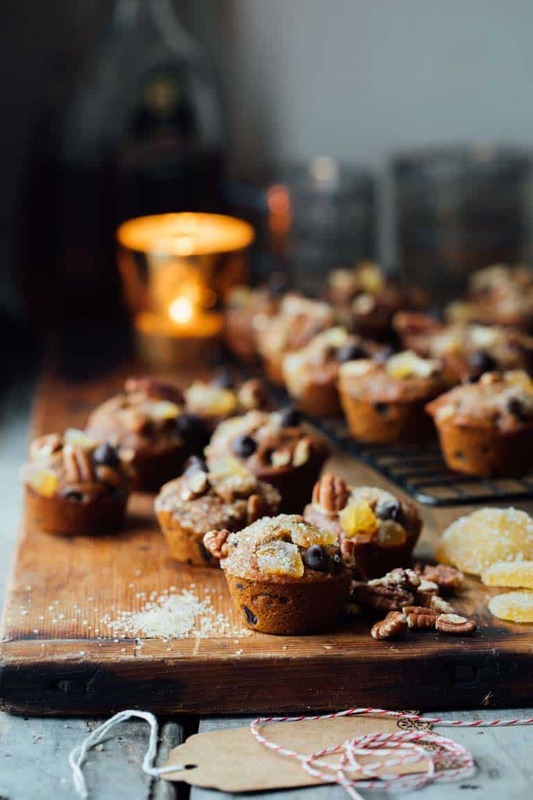 What if I made little-tiny-mini-fruitcakes and brought them to the exchange? I pitted and chopped Medjool dates, soaked them in hot coffee to soften them up a bit. Then pureed that together to act as the sweetener for the batter instead of refined sugar. I also used molasses for that classic fruitcake taste. Of course, I had to use whole-wheat flour as I do with most of my baking recipes. Instead of crazy green candied cherries, I used dried organic cherries and raisins. I upped the flavor with orange zest (which is virtually calorie free), chopped crystallized ginger and a splash of dark rum… oh yeah! In a final effort to convert the non-fruitcake-loving crowd, I added a handful of chocolate chips. Who doesn’t love those? 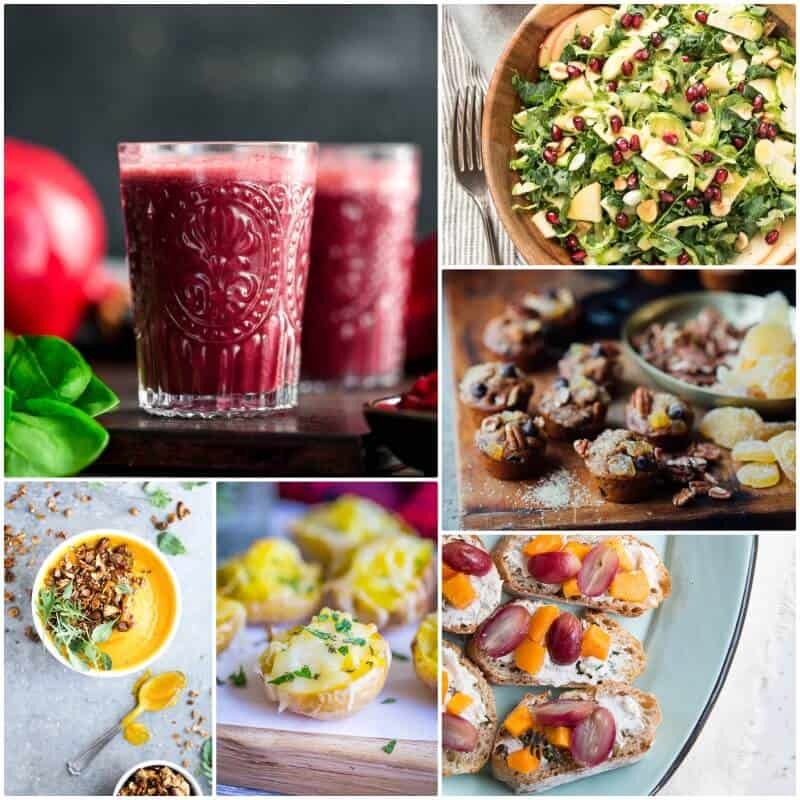 Today also happens to be this month’s Eat Seasonal Round Up where some of my blogging friends come together to share recipes featuring seasonal produce. See our recipes here in this collage and the links below. If you make this recipe, or any recipe from Healthy Seasonal Recipes, I always love to hear about it! Please come back and let me know by leaving a comment or star rating. And it’s always fun to connect on social media. So be sure to tag me @healthyseasonal when you do! 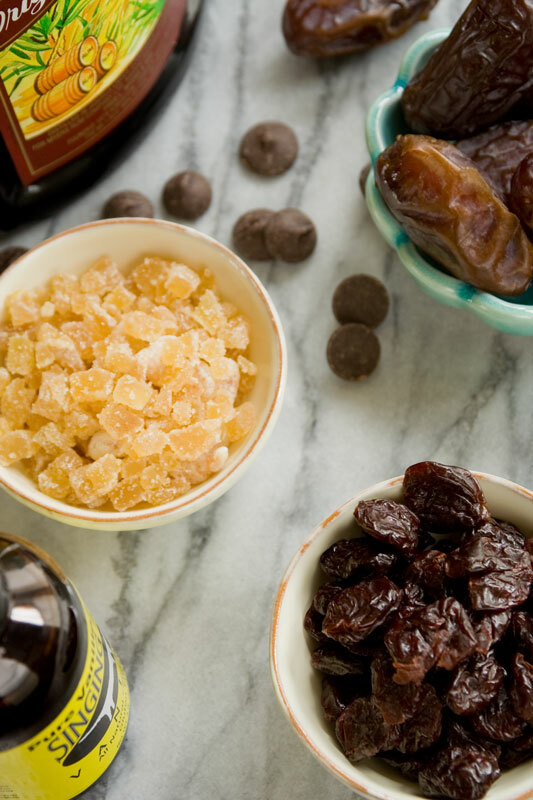 This Christmas dessert tradition gets a healthier update! 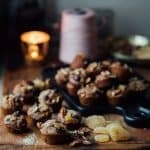 These sweet and fruity Mini Fruitcakes are the perfect tiny whole wheat and dairy free sweet treat to take to a cookie exchange or add to your Holiday cookie platter! Arrange oven rack in the center of the oven. 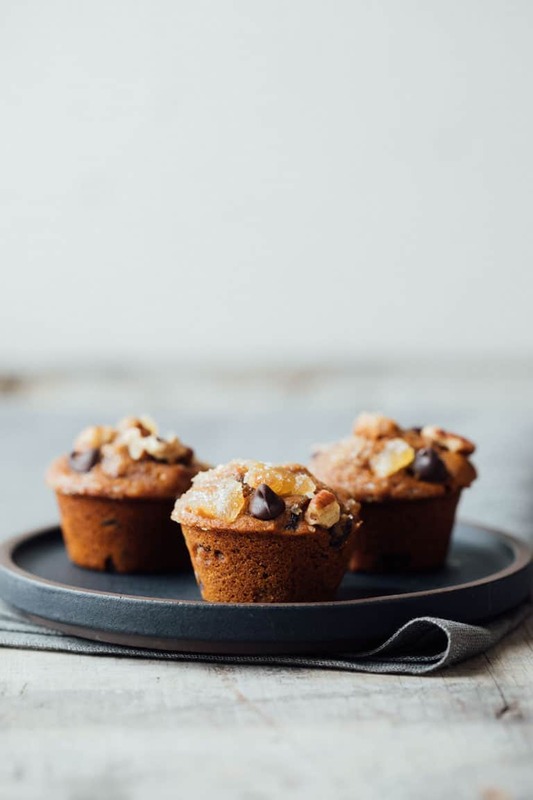 Preheat oven to 350 degrees F. Line 2 mini-muffin pans with muffin cup liners or coat with cooking spray. Pour hot coffee over chopped dates in a small bowl. Toss cherries and raisins with the Bourbon, rum or brandy in another small bowl. Set both aside to soften, 10 to 20 minutes. Whisk whole-wheat flour, all-purpose flour, baking powder, ground ginger, cinnamon and salt in a medium bowl. Puree dates and coffee in a food processor or blender until they form a smooth paste. Scrape out into a large bowl. Add egg, oil, molasses, vanilla and orange zest and stir until combined. Add flour mixture to the date mixture and stir until thoroughly combined. 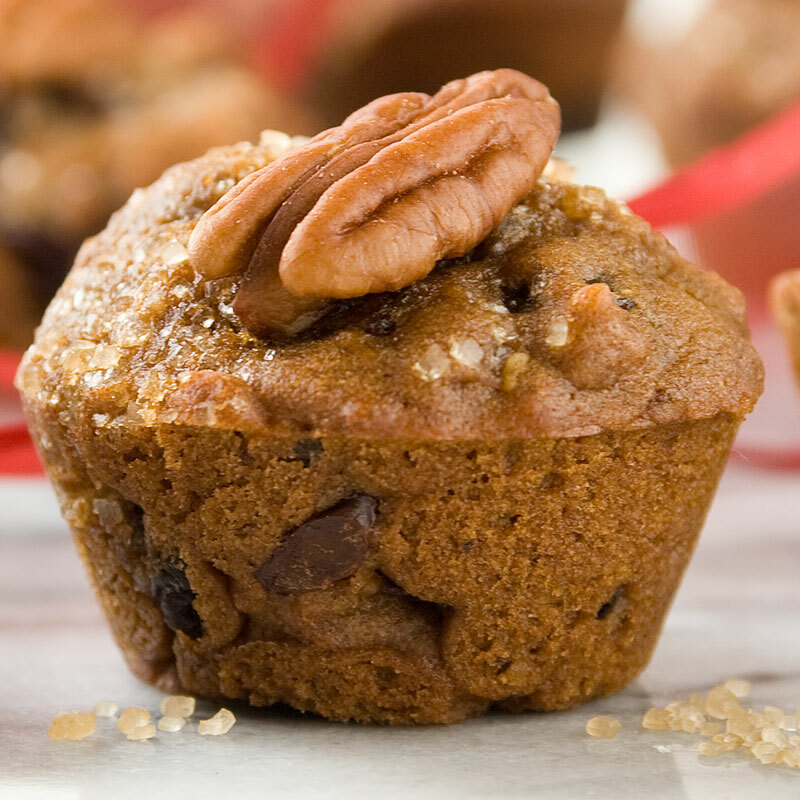 Stir in chocolate chips, ½ cup chopped pecans, crystallized ginger and the cherry mixture. Stir until the goodies are thoroughly incorporated into the batter. 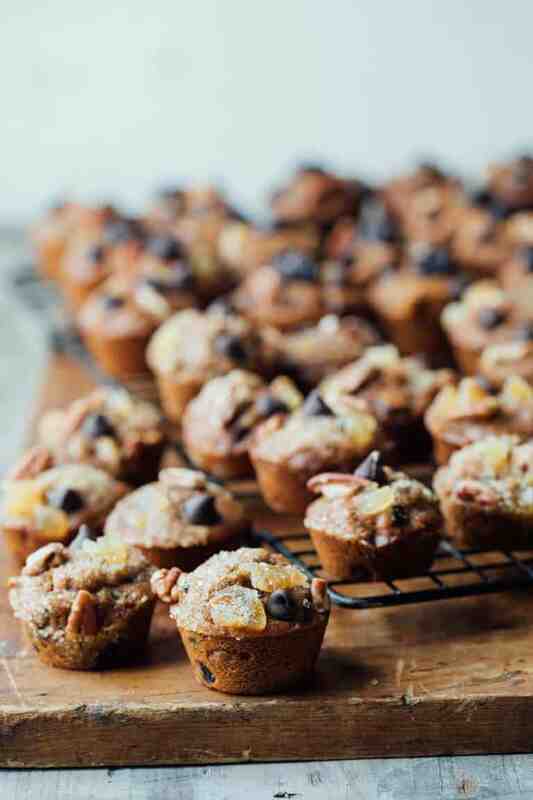 Drop batter by rounded tablespoons into the muffin cups. 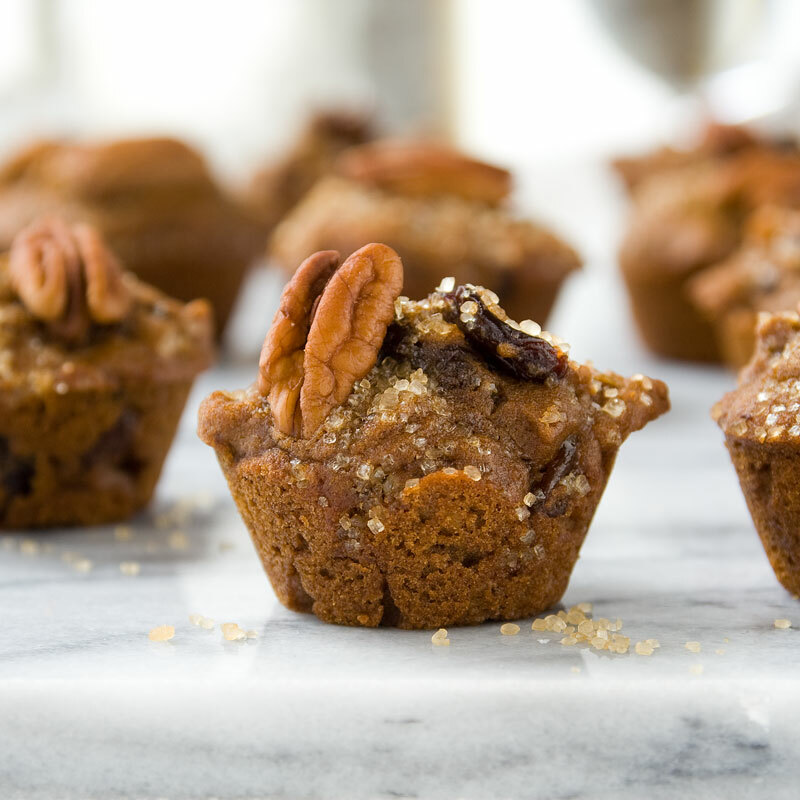 Sprinkle each with turbinado sugar and place a pecan half on top. Bake, rotating pans half way, until the cakes are puffed and set-up 14 to17 minutes. Let cool 3 to 5 minutes in pans before removing to a cooling rack. Repeat with the remaining batter. I LOVE the new photos, Katie! And admittedly, I’ve never had fruit cake. I know it gets such a bad rap. But I really want to try it. These little bites look like the perfect way to do that! I can understand why most fruitcakes get a bad rap. They’re bad. Lol. These are totally different. And thank you for the compliment about the photos. I appreciate it. I’d take these mini fruit cakes (minus the day-glow cherries!) over cookies any day. 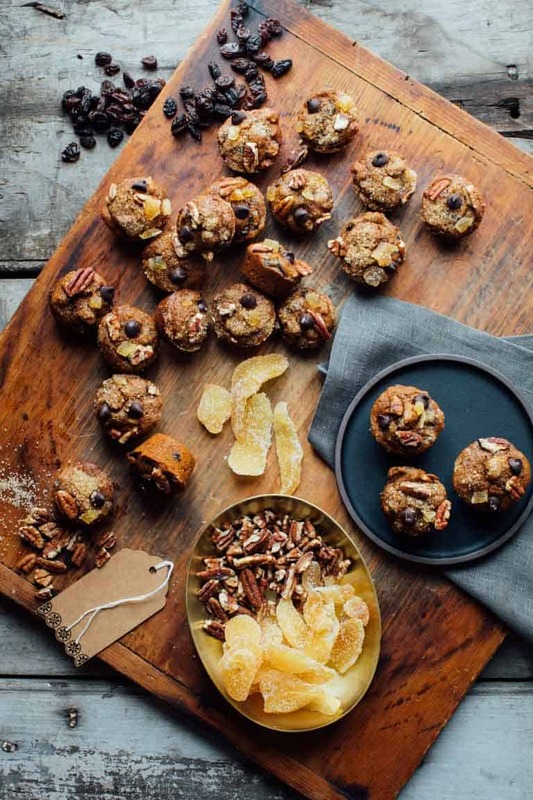 I love that they’re so wholesome and would work for breakfast, snacks or a holiday treat. That coffee-date combo is genius! My kids did eat them for breakfast actually! I’m glad you said that about the coffee and dates because they really help boost the flavor. So thanks. Have a great weekend Marcie. I think I may need to revisit fruitcakes as an adult. Now I love all of these ingredients you have in these!! Totally Becky. These are grown up approved. Really? Well, don’t even try the kind with the bizarre green cherries. Go straight to these! Thanks so much for coming by Izzy. Cheers! Definitely! The smell of ginger and molasses always reminds me of December. I’m definitely on Team Fruitcake. And these mini ones look so lovely and special! Thanks so much Kate. Go team fruitcake! How cute are these. Anything mini is better in my opinion. These would be perfect for Christmas Eve. I’m sure Santa wouldn’t mind a couple of these on his cookie plate. Ha ha. I love fruitcake and these mini versions look fab. Great how you’ve made them healthier. I’m so glad you like the Kathryn. Have a great day. Fruitcake has never been my favorite, but the combination you have here makes me rethink that. I love that it has crystallized ginger. yay, I hope they change your mind! Thanks so much Leslie. Have a great weekend. I have nothing against fruitcakes so I would love to take a bite of these! And love that they are dairy free! Glad to know you’re not a fruitcake hater Vicky, lol. Thanks for dropping by today. im not so much into caffeine in my fruit cake.. wondering.. might use a fruit juice instead.. ? and I am allergic to Wheat flour, thinking Coconut flour instead? Hi Blue, you can use decaf coffee, apple juice or apple cider instead. I recommend King Arthur Flour Gluten Free Measure For Measure instead of the wheat flour. https://www.kingarthurflour.com/products/gluten-free-measure-for-measure-flour/ It’s a great sub and wheat free.